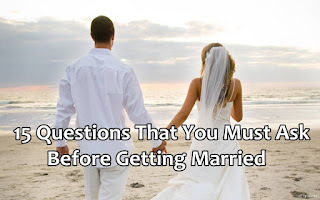 These questions will help you get your answer for whatever thing you want before getting married these are also surveyed by the New York Times and are regarded as most relevant questions to be asked according to the survey. 1) Have we discussed our expectations for how the household will be maintained, and are we in agreement on who will manage the chores? 2) Have we fully disclosed our health histories, both physical and mental? 3) Have we discussed whether or not to have children, and if the answer is yes, who is going to be the primary care giver? 4) Do we have a clear idea of each other’s financial obligations and goals, and do our ideas about spending and saving mesh? 5) Will there be a television in the bedroom? 7) Is my partner affectionate to the degree that I expect? 10) What does my family do that annoys you? 12) Do we like and respect each other’s friends? If you get these all answers and are happy with it, you will be avoiding the fights and misunderstanding which you can have ahead.